This is one of my favorite photographs, the kind I tend to hoard until the perfect moment. I put it in the same league with the wonderfully evocative photograph in That night at Maxim’s. It seems just right for the first post of a new year. Once again, I invite readers to imagine what is going on. I know little other than that they are in a restaurant in New York City. Because they are seated at a banquette, and because the photo was almost certainly taken by a professional photographer, I would guess it is a nightclub restaurant, or certainly a special occasion type of place. Judging from their outfits and the style of the mural behind them, I think it is the late 1940s or early 1950s. I love how directly they look at the photographer and how contented they are. I think the woman in the middle is the mother of the woman on the left. Perhaps it is her birthday. Could the other be a cousin? She seems to have been interrupted just as she is about to present what looks like a check to the older woman. They are drinking manhattans or martinis, not paying too much attention to their salads, and totally ignoring the mound of dinner rolls piled so unceremoniously on a too-small plate. 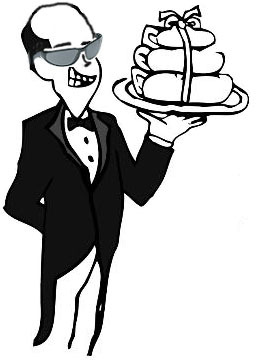 The awkward way the rolls are served and the ordinary serviceable restaurant ware (water tumblers, dishes, and salt and pepper shakers) makes me think it is not an elite restaurant. Still, love those butter pats on the tiny plates! 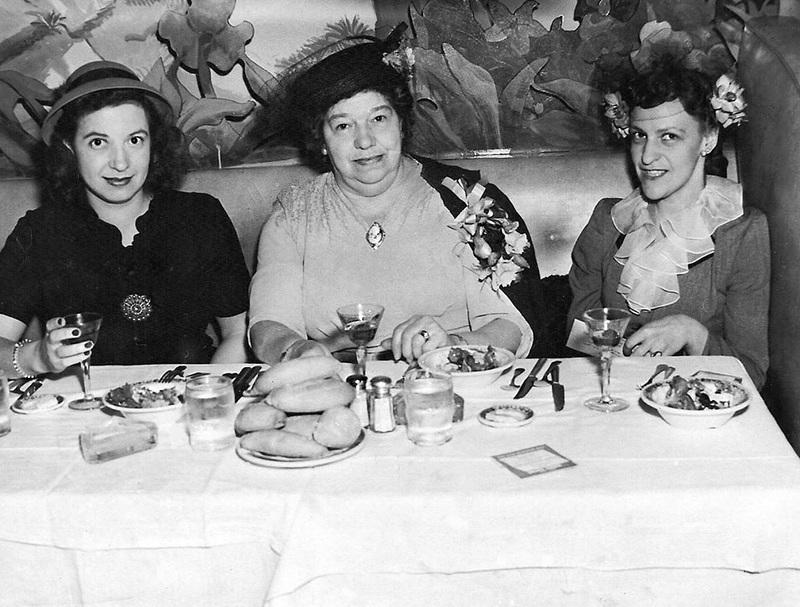 The only objects in the photograph that I cannot identify are two small squares of paper on the table, one in the foreground right and the other just beyond the salad of the woman on the right. Forms to fill out for the photographer? 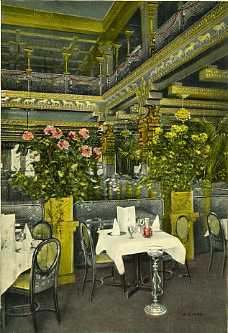 In 1910 the media was abuzz with the new Café de l’Opera on Broadway between 41st and 42nd streets in NYC. Its enormous cost and the stunning, over-the-top lavishness of its interior set a new standard for opulence on the glittering White Way. 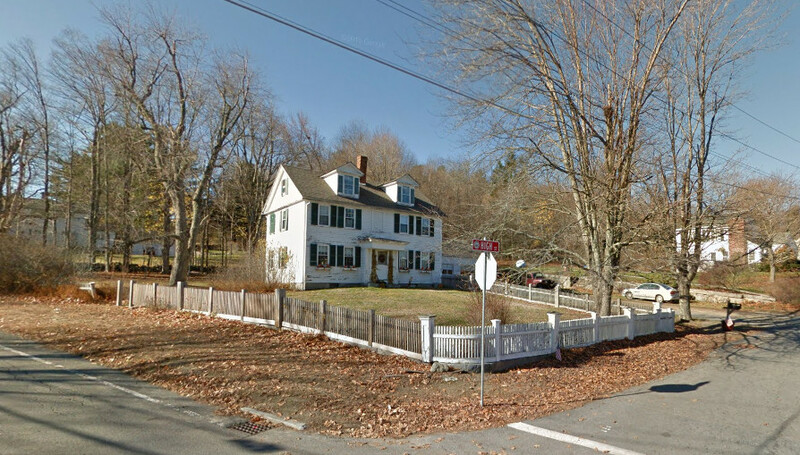 Could anyone have guessed that in a mere four months this splendid “lobster palace” would fail? 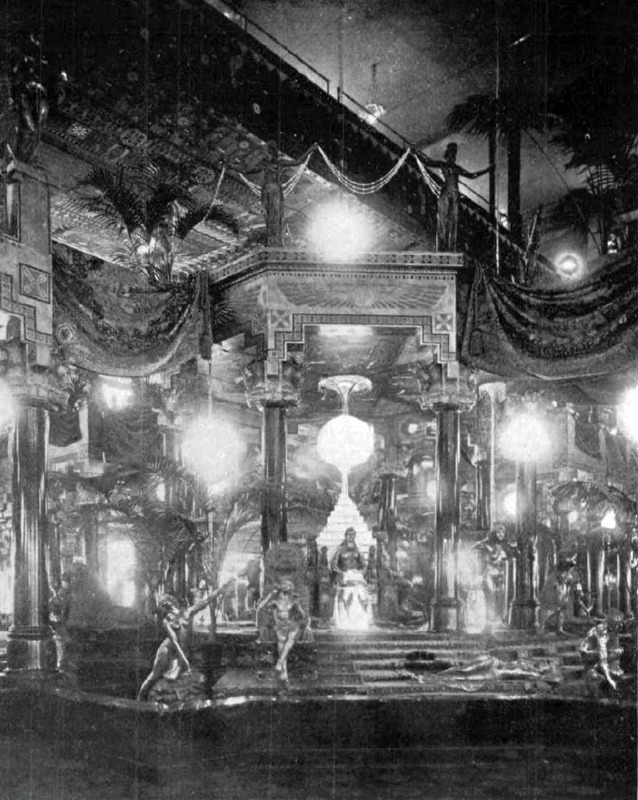 Given its fate, how perfect was it that the crowning jewel of the interior decor was a billboard-sized painting of the fall of Babylon installed prominently on a landing of the 22-ft wide staircase? 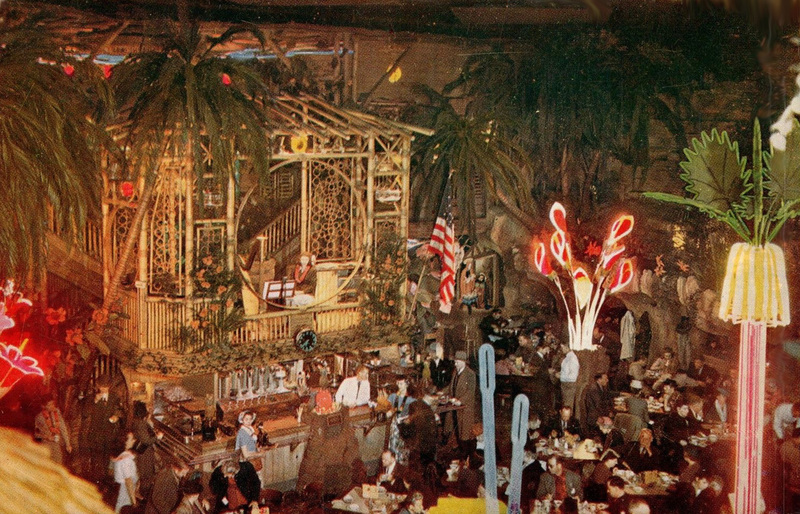 The after-theater eatery was designed to be the showplace of Times Square. 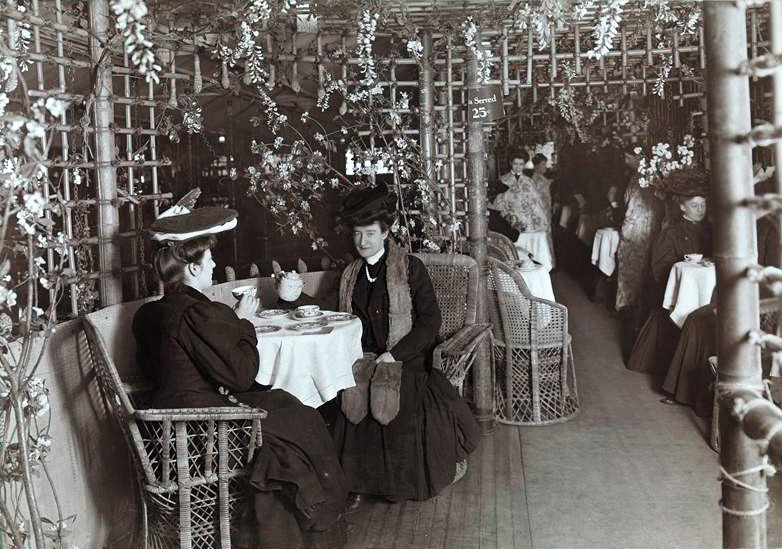 It was financed by a consortium of investors that included architect/decorator Henry Erkins and John Murray, impressario of the almost-as-splendiferous Murray’s Roman Gardens, also designed by Erkins. 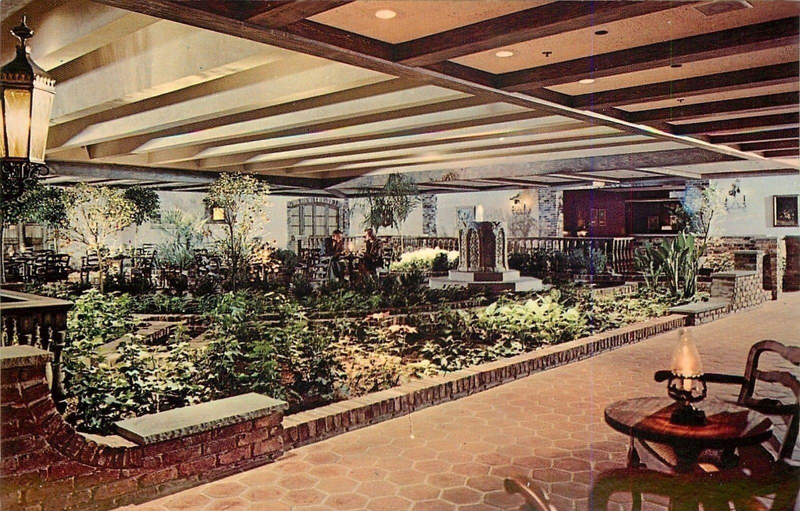 The team sunk millions into gutting the old Saranac Hotel and turning it into a fantasy Babylonian stage set worthy of the Hippodrome. 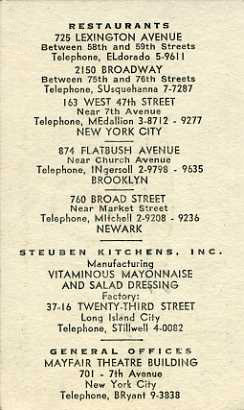 The bill for interior renovations and decor, under Erkins’ direction with Stern Brothers department store acting as general contractor, came to $1,250,000, a sum that borders on $30 million in today’s dollars. 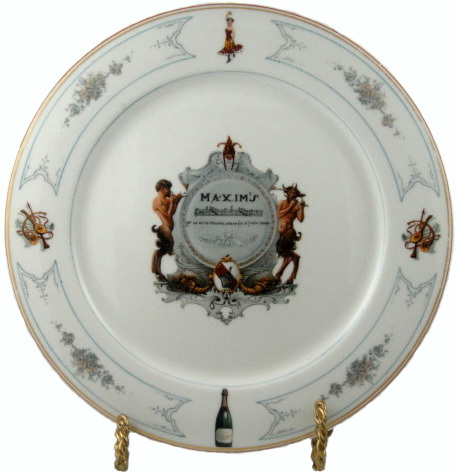 The silver service alone cost a quarter of a million 1910 dollars, while a huge painting by Georges Rochegrosse cost something like $50,000. Er, or so it was gushingly reported. However another source claimed the painting was a copy, which is probably true. As for many of the imported ancient treasures, they were replicas cast from Middle Eastern artifacts housed in British and French museums. The gleaming black marble covering interior surfaces and pillars on the ground floor and balconies was artificial. The interior was a startling demonstration of the transformative power of life-size statuary, concealed lighting, mirrored walls, and a million or so sheets of gold leaf. The electrical industry was thrilled with the restaurant’s flair for showcasing what miracles modern lighting could perform. But the architectural community was rather scandalized. They hid their distaste in a haze of apparent flattery, producing choked praise in which adjectives like magnificent served as insults. The “lurid and gorgeous” restaurant was so overwhelming it could “overcome at once the more sober judgment of the critic,” claimed The Architects’ and Builders’ Magazine. 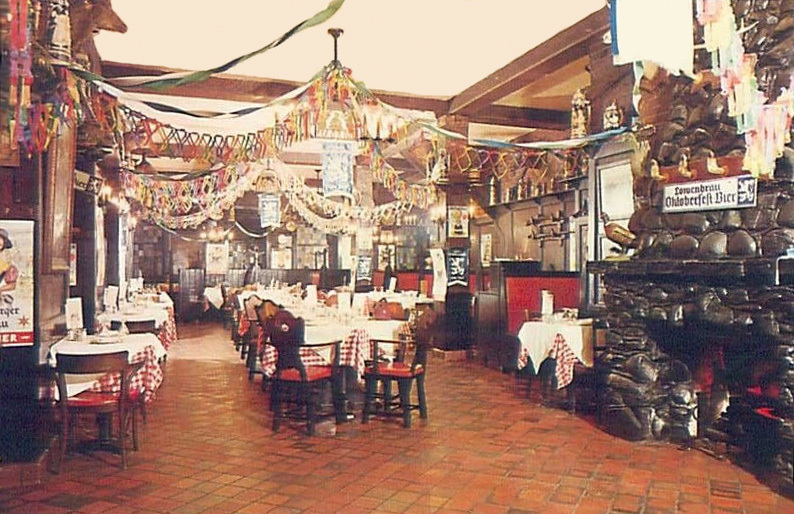 The restaurant’s dining rooms occupied four floors with its main kitchen located above them. 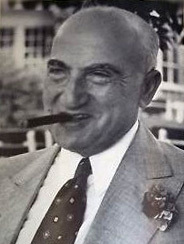 Manager Henri Pruger, hired from the Hotel Savoy in London at the princely salary of $50,000 a year, oversaw a staff of 750. Six months after arriving in NYC he headed back home, and one can only wonder how much of his salary he managed to collect. Stern Brothers wasted no time seizing all the furnishings for auction but a goodly number of them apparently were acquired by the new owner, Louis Martin. 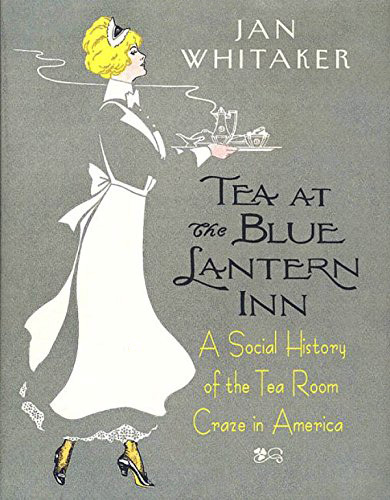 A restaurant pro, he had formerly presided over the famed Café Martin at Broadway and 26th with his brother J. 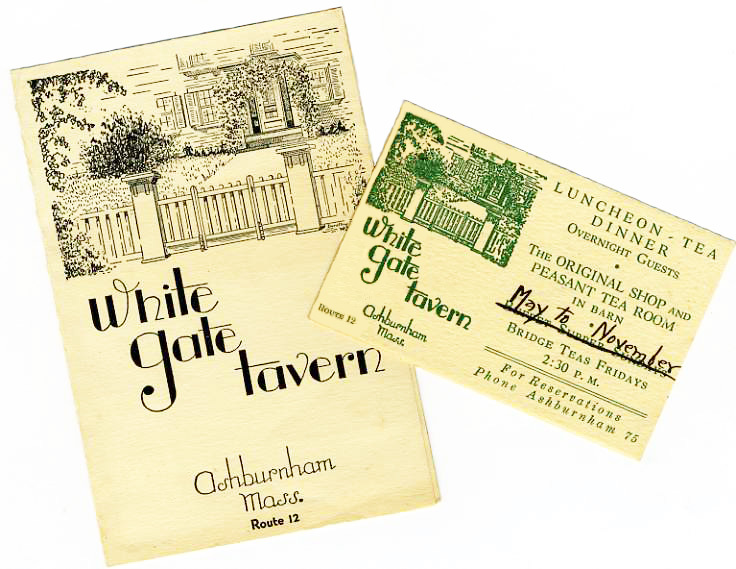 B.
Martin quickly made changes, moving the kitchen to the basement to solve the problem of food arriving cold at the tables as had happened under the previous management. 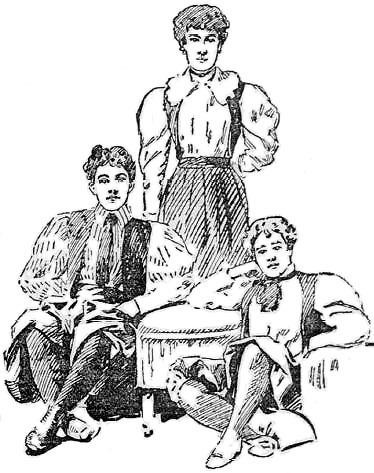 He installed a bar on the first floor and eliminated the previous regime’s terrifically unpopular formal dress requirement, said to be an English notion. But the jinx was on. If ever a location reeked with bad omens, it was this. 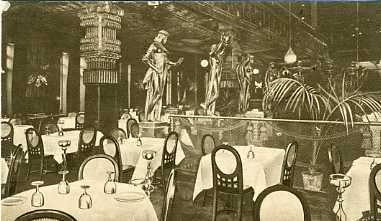 On opening night in December 1910 an employee of the Café de l’Opera started an accidental fire in a storeroom causing firemen to parade through the dining room with axes. Well, there was that foreboding fall of Babylon depicting invaders in the banquet hall. But what possessed Louis Martin to create a dining room lighted by a dozen perched owls with electrified eyes the size of silver dollars? 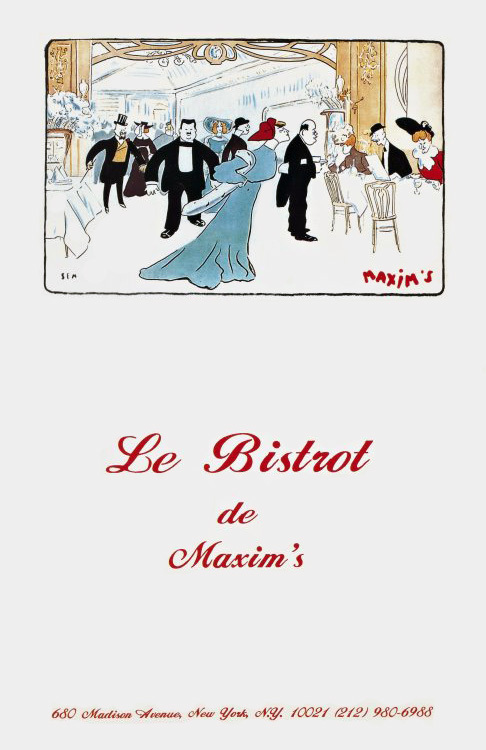 Martin, who ran the restaurant as Café Louis Martin, withdrew from the business in 1913. 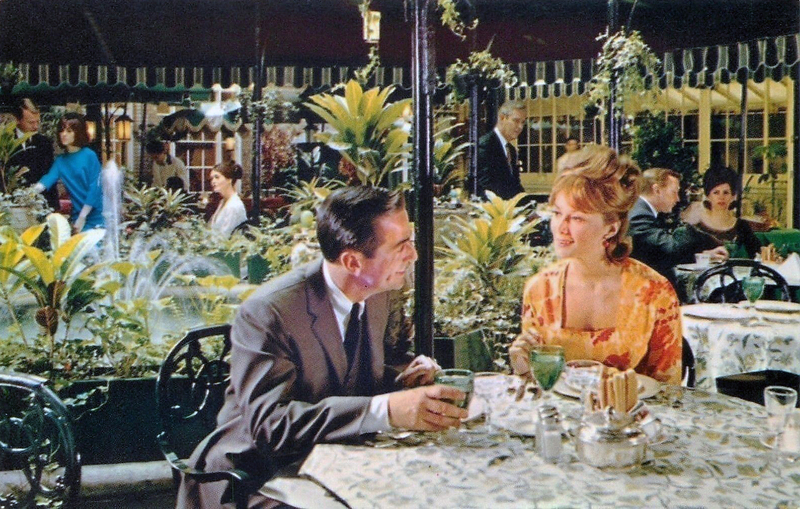 The new management renamed it the Café de Paris. 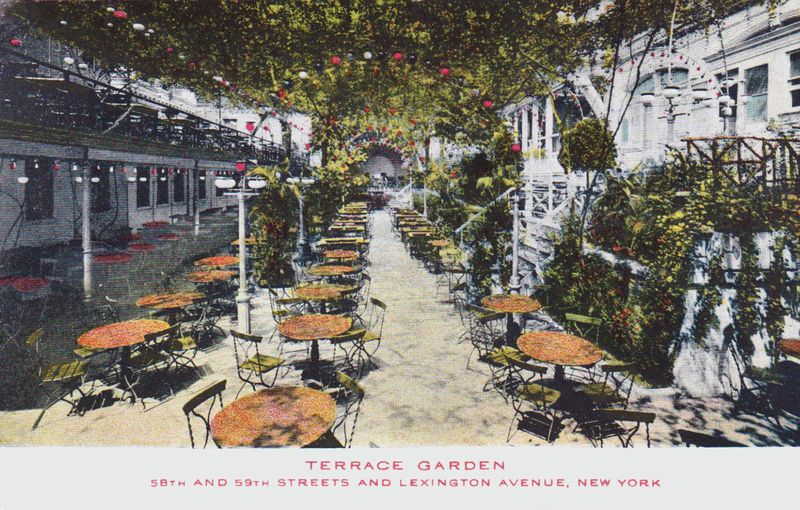 On the color postcard shown here it is clear that the golden statues on the balcony are gone, replaced by flowers during this incarnation. 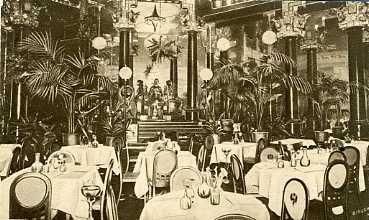 In 1914 the Café de Paris went bankrupt and in February the restaurant’s “furniture, pictures, ornaments, rugs, carpets, curtains, linen, tableware, kitchenware, and other equipment and furnishings” were auctioned. The building was razed in 1915. 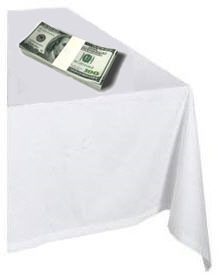 One trouble with the ideal of snowy white restaurant linens is, of course, laundry that piles up and must be washed. By the late 19th century huge steam laundries in big cities were able to handle up to 100,000 pieces a day. And about the same time a new idea in laundry service came along. Rather than owning linens a restaurant could, in effect, rent them from a service that would bring fresh supplies every time they picked up dirty laundry. Many of the first such businesses called themselves towel services, reflecting that their primary customers were factories using thousands of shop towels. 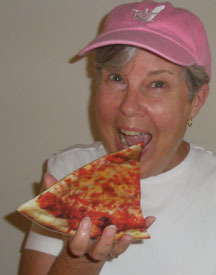 Restaurants and hotels developed as the next customer base. According to a book called Service Imperative, it was around World War I that the modern linen supply industry developed, with over 900 firms in the US. Most were in New York, followed by Illinois, Ohio, and Pennsylvania. 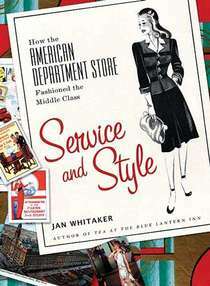 At about the same time a national organization of linen supply companies was formed, the forerunner to the Linen Supply Association of America, renamed the Textile Rental Services Association of America in 1979 to better reflect the full range of member services – and to improve the organization’s public image. It seems to me that the name change was mostly about public relations. While it may have been true that “linen supply” did not reflect all services, the difference between “textile rental” and “linen supply” is a bit subtle. Why the change? On the face of it the words “linen supply” sound completely innocent. Yet by the mid 20th century they had acquired a negative tinge thanks to mob infiltration in the business coupled with widely publicized congressional hearings, particularly the U.S. Senate’s McClellan committee which investigated organized crime in the late 1950s and early 1960s. 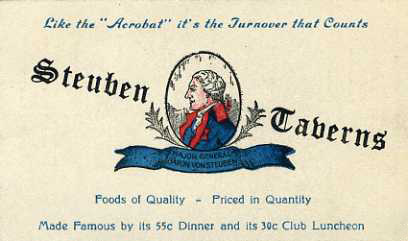 Linen supply was one of a number of services to restaurants, along with garbage hauling, that attracted the mob in the 1920s and even more so in the 1930s when Prohibition ended and bootlegging profits dwindled. It offered itself as a legitimate business in which it was possible to gain dominance rapidly as well as a way for mobsters who had migrated into narcotics to launder money. In Kansas City, a mob magnet in the 1930s, gangs made handsome profits in linen supply. Running the industry as a monopoly, they reportedly divided up the city, agreed not to compete, and set prices high. 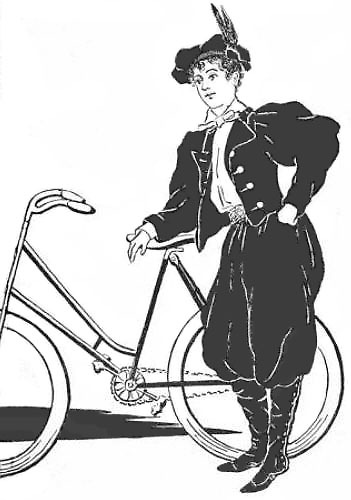 Certainly not all linen supply companies were, or are, mob affiliated or engaged in illegal activities, yet in some places – notably NYC, Chicago, and Detroit — many have been. In 1958 New Jersey linen supply corporations charged with violation of anti-trust laws were said to control 85% of business in that state. Linen supply racketeering continues today. In 2003 the NY Times reported that the president of White Plains Coat & Apron Co., doing business with restaurants in NYC, Westchester, and parts of Connecticut and New Jersey, pled guilty to conspiring to restrain trade over a ten-year period in which sales had totaled better than $500M.